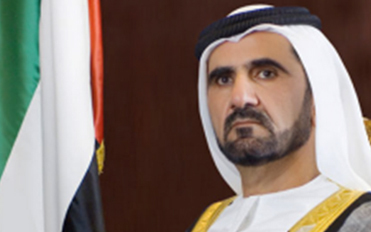 Sheikh Mohammed bin Rashid Al Maktoum is the Vice President and Prime Minister of the United Arab Emirates, the Ruler of Dubai and the UAE Minister of Defense. He assumed these duties on January 4th, 2006. Under his leadership and drive, and over the past two decades, Dubai witnessed outstanding economic growth and prosperity and ascended to its current position as a regional hub for commerce, finance, tourism, transport, media, and information technology. Dubai grew into a flourishing global city symbolizing tolerance and multiculturalism with over 200 nationalities living and working in the Emirate. The GDP grew by over 15% over the past decade and oil revenues contribution to GDP dropped to less than 4% while foreign direct investments flourished. During this period, Dubai established a leading international airline and became a regional hub and international operator for ports, managing various regional and international ports. Sheikh Mohammed Bin Rashid has overseen the design, implementation, and management of the major drivers of this growth which included various pioneering economic clusters with an equal focus on education and knowledge where some of the world’s most prestigious institutions are present. These developments where paralleled by an equal improvement in government operations and services, a transformation that Sheikh Mohammed personally led, placing Dubai amongst regional leaders in this field. Whilst establishing Dubai as a regional hub, Sheikh Mohammed continued to focus on pan-Arab interest and causes and Dubai continues to lead major investments and developments in countries in the region while his philanthropy benefited many across the Arab and Islamic world. Born in Dubai in 1949, Sheikh Mohammed attended the Mons Officer Cadet School in Aldershot, UK. He then returned to Dubai to lead the Dubai Police and serve later as the UAE Minister of Defense and Crown Prince of Dubai. Sheikh Mohammed bin Rashid holds a number of decorations from various countries and distinguished international institutions. He is also a keen sportsman and won various awards in horse riding (namely endurance racing) and has earned international recognition for owning the Godolphin stables, considered to be among the finest stables in the world. His other interests include poetry where he is a published poet with what is considered to be some of the of the best Nabati poetry, and he recently authored the book “My Vision” Which is one of the best selling Arabic books.